Secretion of a target protein is a common expression strategy in yeast. This approach is used to produce recombinant extracellular eukaryotic proteins that often do not express well in bacteria. One technical challenge is that a secreted target protein becomes diluted in large volumes of growth medium complicating its recovery. Additionally, many common tags do not perform well, either being limited in their scalability (e.g. antibody resins) or often suffering from interference by growth medium components (e.g. nickel affinity resins). The pKLCF-series vectors offer the ability to secrete a target protein fused to a chitin binding domain (CBD) tag in the yeast Kluyveromyces lactis. The CBD tag permits rapid recovery of secreted fusion proteins using chitin resin or chitin magnetic beads. The CBD tag tightly and selectively binds chitin without the need for concentrating or buffer exchanging the growth medium. Elution from chitin occurs sharply upon brief exposure to a high pH buffer. Different pKLCF-series vectors permit construction of N- or C-terminal CBD tags on the target protein. A protease site can be engineered between the CBD and target protein. To further enhance the purity of purified CBD-tagged proteins, an engineered K. lactis strain that lacks endogenous chitin-binding proteins may be used as a host. In the nucleus, an integrated expression vector encoding a fusion between the α-MF domain (blue) and a desired protein (black) is expressed. A signal peptide in the α-MF domain directs entry of the fusion protein into the endoplasmic reticulum (ER) and is removed by signal peptidase (SP). 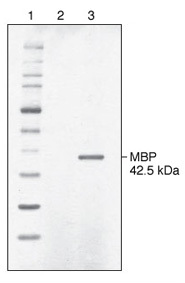 The fusion protein is transported to the Golgi where the Kex protease removes the α-MF domain. The protein of interest is then secreted from the cell. Where can I find sequence and restriction maps of NEB's expression vectors? Lane 2: spent culture medium (15 µl) from wild-type K. lactis cells. Lane 3: spent culture medium (15 µl) from K. lactis cells harboring an integrated expression cassette containing the E. coli malE gene. 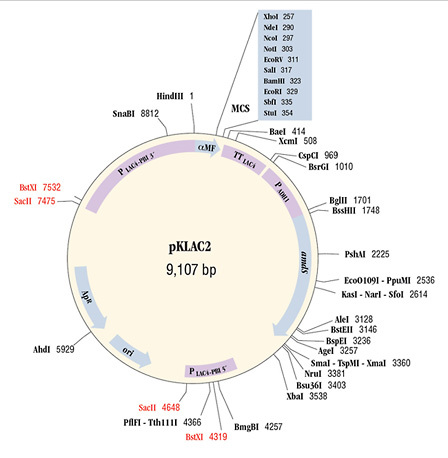 pKLAC2 (9107 bp) contains the 5´ and 3´ ends of the LAC4 promoter (PLAC4-PBI) separated by DNA encoding β-lactamase (ApR) and the pMB1 origin (ori) to allow for its propagation in E. coli. The K. lactis α-mating factor secretion leader sequence (α-MF), multiple cloning site (MCS), and the LAC4 transcription terminator (TT) lie immediately downstream of 3´ PLAC4-PBI. The yeast ADH1 promoter (PADH1) drives expression of an acetamidase selectable marker gene (amdS). The vector can be linearized by digestion with SacII or BstXI to create a linear DNA fragment capable of inserting into the native LAC4 promoter region of the K. lactis genome. 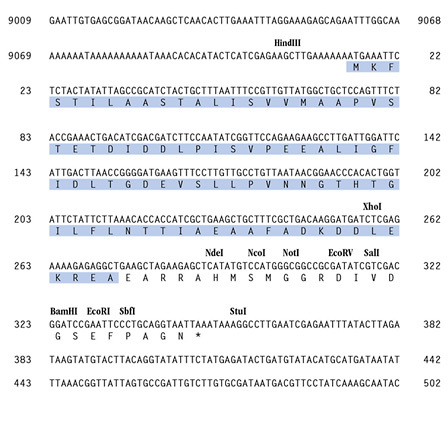 pKLAC2 (9107 bp) contains the K. lactis α-mating factor secretion leader sequence (blue background) and a polylinker immediately downstream of the PLAC4-PBI promoter. Unique polylinker restriction sites are indicated. Half arrows show the positions of pKLAC-series vector-specific sequencing primers available from New England Biolabs.